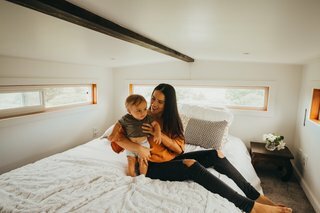 Custom-built from the ground up, a 360-square-foot tiny house on wheels is an affordable, off-grid paradise for a family of three in Hawaii. 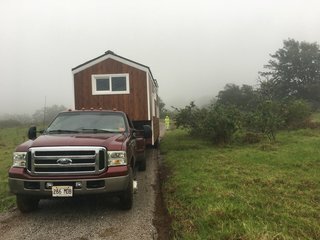 Fed up with the lack of affordable housing in Maui, Zeena and Shane decided to take matters into their own hands by designing and building a custom tiny house from the ground up. "Rather than paying a chunk of our income into something we would never own, we decided to take the risk to build something specifically for us," Zeena says. 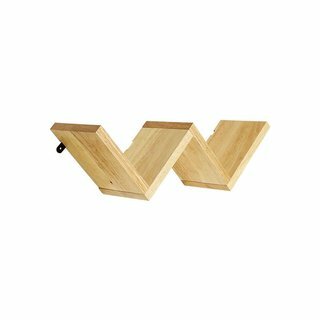 "It also helped that my husband comes from a family of carpenters, which influenced our decision greatly because we had the tools and skills to complete this project." 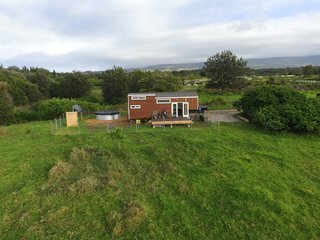 Set on a quarter-acre pasture rented from a family friend in Maui, the tiny house operates entirely off-grid with electricity, water, and sewer needs handled on-site. 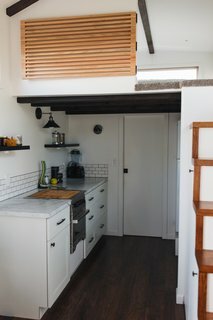 A self-described "labor of love," the tiny house took the couple two years to complete between their full-time jobs—the ambitious design/build was also made all the more challenging by the couple’s concurrent wedding planning. To stay within their tight budget of $45,000, the newlyweds did all the work themselves with help from Shane’s father, a master carpenter. 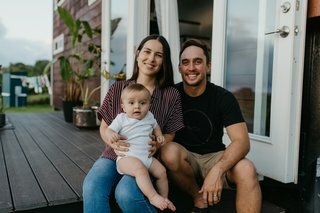 Zeena, Shane, and their one-year-old son, Maverick, on the porch of their tiny house. Tongue-and-groove cedar siding clads the exterior. The windows are by Alpine. "From fabricating the trailer to plumbing and electrical, we did it all," Zeena notes, adding that building the 26-foot gooseneck steel trailer themselves ended up saving thousands of dollars. 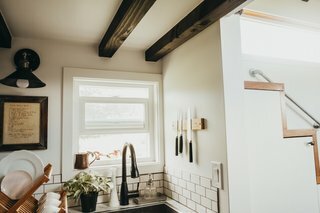 "I wish we hired someone to do the taping and finishing of the drywall—this was my least favorite project to complete in our house—but we didn’t. In the end, it was such an incredible experience to have worked every stage of the build." 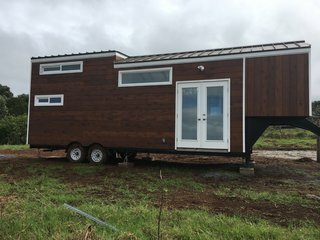 Set on wheels, the 350-square-foot tiny house can be towed with a truck. 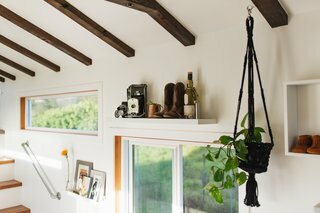 Despite the mobile nature of the dwelling, the couple installed drywall to achieve a smooth, clean finish on the interior; a few cracks did appear after moving the home, but the couple both agree the drywall was worth it. Having grown up in Maui, Zeena and Shane cultivated a love for nature and wanted to bring the outdoors in with plenty of natural light, stained wood details, and an abundance of landscape views. An open floor plan and high ceilings also helped create a spacious, airy feel. The exposed ceiling beams pop against the all-white interior. Zeena adds, "The one design element that I love so much is how we wrapped the interior window sills with stained wood. 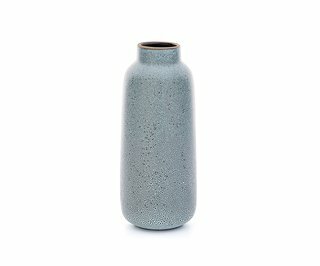 With so much white in our home, this element adds an interior warmth, especially when the sun hits it." 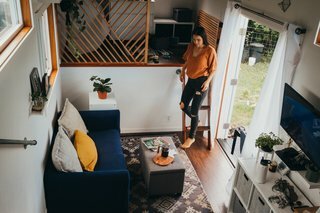 Perhaps the biggest nod to the couple’s commitment to sustainable living—and savvy financial planning—is the tiny home’s off-grid operations. 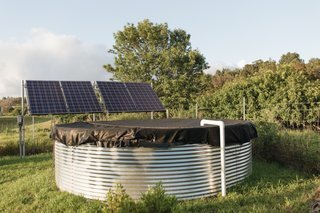 Solar panels power the home’s electricity needs while a 3,000-gallon rainwater catchment tank provides the water supply. The bathroom is equipped with a composting toilet. The 3,000-gallon rainwater catchment tank is by Eco Products Maui while the solar panels are from altE Store. A few months after the couple moved into their new home in January 2017, Zeena became pregnant with their son, Maverick. Although their initial design didn’t accommodate a baby, the couple successfully modified their office into a nursery. Next to the living room is an elevated space that, formerly used as an office, has now been converted into the nursery. The cozy living room is furnished with a hand-me-down couch with a cover purchased from Amazon. The ottoman is from TJ Maxx. The area rug, side table, and pillows are from Target. 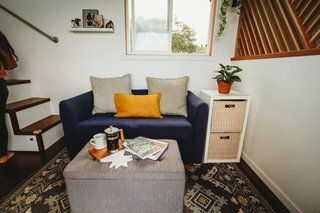 "I absolutely love that we got to design our home for us," Zeena says. 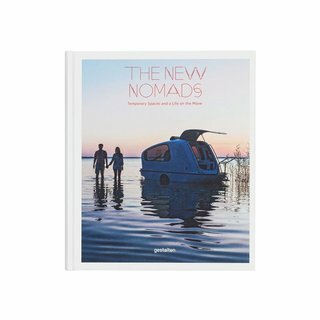 "It’s functional for our lifestyle, and the size constraints having been such a lesson on minimalism." 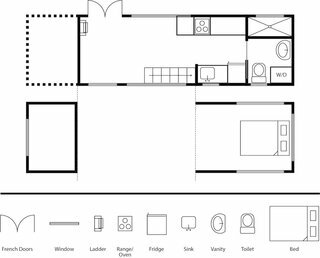 The loft bedroom is located above the galley kitchen and bathroom, and is accessed via stairs with built-in shelving. Bathed in light thanks to panorama windows on three sides, the bedroom loft is 11 feet deep with a four-foot-tall ceiling height. "We have loved every moment of paring down our things. 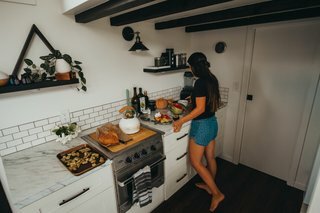 It’s definitely been a process, but the peace, order, and calmness that fills our home now has been a refreshing reward to the new lifestyle change." The galley kitchen features a range/oven on one side and the sink and fridge on the other. The bathroom is behind the door next to the kitchen. 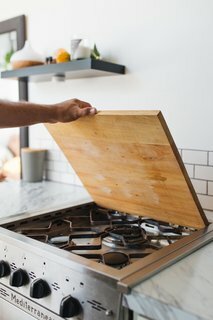 The Mediterranean Three Burner Propane Stove from Dickinson Marine was installed in the compact kitchen. 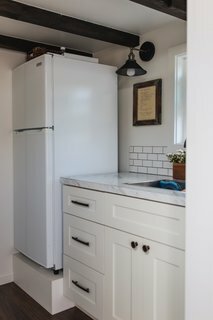 A Vissiani refrigerator stands next to the kitchen's formica countertops. The lights are from Ecopower. A look at the sink in the galley kitchen with a subway tile backsplash. An Eccotemp FVI 1-2 tankless water heater (purchased from Home Depot) is hooked up to the water supply. Have your own Budget Breakdown to share? Find out how to submit to Dwell.